We don’t need to tell the 2.2 million men and women doing time how dangerous, unhealthy, and inefficient U.S. incarceration is. 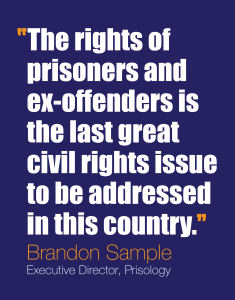 Prisoners know firsthand: they’re in for lengthy sentences that don’t fairly match the crime, suffering in overcrowded facilities, fearful of violence, tolerating unhealthy conditions, enduring unjust limits on civil rights, with few chances for a head start on a better life. Prisology is every prisoner’s advocate: working for fair sentences, pushing for health and drug treatment programs, educational and transitional services to help ex-offenders achieve a better future. But we can’t do it alone. America’s 2.2 million prisoners are a vast force for change. Stand up for the rights you’ve been denied! Prisology is a valuable tool for prisoners, through which you can advocate effectively for reform. Write for us, and alert Americans of the injustices of the criminal justice system, or press policymakers successfully for reform. With Your Help, Greater Victories Lie Ahead. Join Us!